I likely won't ever get an opportunaty like this again! 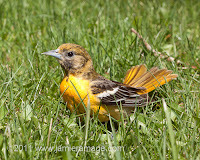 ...The chance to take an unlimited number of pictures of a wild bird - at less than arm's length! During one of my trips into the garage, I heard a 'thumping' overhead. An oriole had become trapped in the rafters and was now trying to get out of the garage through what appeared to be the only exit on her level - a window. ...A CLOSED window. The little thing kept trying and trying, only to thump her noggin so hard she had become dazed. She was so dazed in fact, she willingly stepped onto a broom that I'd reached up near her feet. I let hert loose on the grass, where she just sat there, staring at me. Realizing this was likely going to last for a few minutes, I ran for the camera! This was GREAT! 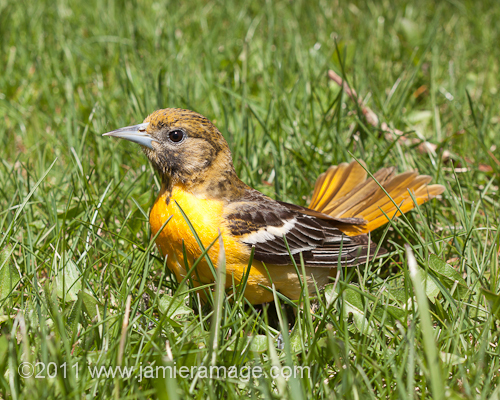 An oriole - not able to move an inch and as a result of disorientation, was now willing to be my subject for quite a time. Eventually, it flew into a not yet blossomed snowball bush and rested about a foot off the ground and then safely took off another few minutes later. Both my wife and mother love orioles, so it looks like I'll be doing some printing soon.